But for those of you newer to the idea of using influencers for B2B, keep reading to see Zeckman’s proof that it works wonders. And as an added bonus, she debunked five other lies about B2B influencer marketing along the way. 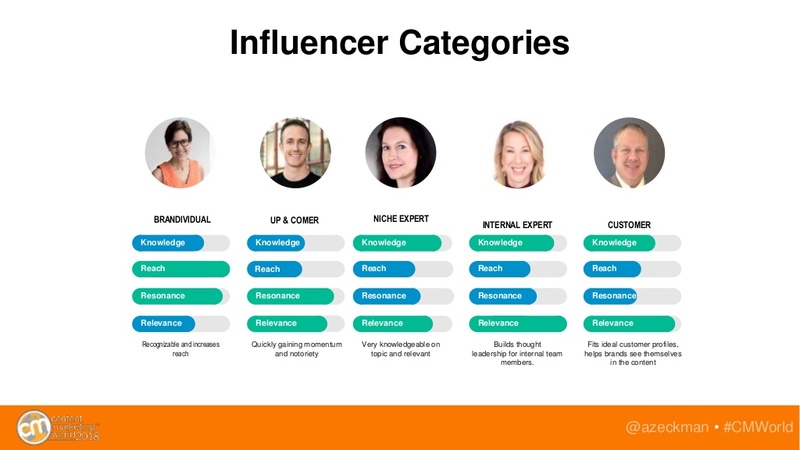 Before digging in to how marketers can use influencer marketing to boost B2B results, Zeckman broke down the difference between B2B and B2C campaigns with a few examples. You’re no doubt familiar with the Marlboro Man, whose face was synonymous with a smoke. You’ve seen Kim Kardashian’s image associated with perfumes, liqueurs, and more than a few fashion labels. And, you probably remember Britney Spears’ “Got Milk?” ad. When you’re looking for influencers to get involved in your B2B campaign, it’s important to know that, no, not all influencers are equal. Nor should they be used interchangeably. Ultimately, choosing your perfect mix all depends on your campaign objectives, Zeckman says. If you’re looking to expand your audience and get eyeballs on your content, brandividuals should be part of the mix. They’re the people with a large audience reach of their own with whom their own content resonates deeply. If your goal is to engage a more specific audience segment, aim to include up-and-comers who resonate with your audience, and are consistently creating content that’s highly and specifically relevant to your target. And if your main focus is to convert, don’t leave out the niche experts or customer influencers, even if they don’t have as many followers as your other influencers. They know the nitty-gritty of the subject matter, and create content that not many others can. Their relevance will make your customers feel comfortable that somebody’s been in their same shoes, and will produce the content that nudges your targets over the finish line. Telling your influencers what to say can be irreversibly damaging to the level of audience trust you’ve worked hard to build. That’s why it’s so important to make sure the influencers you choose for your B2B campaign are already talking about your subject matter. That topical alignment is key, according to Zeckman, regardless of the topic itself. Take, for example, the B2B influencer campaign that Zeckman and TopRank Marketing partnered with Prophix to create. The goal of the campaign was to increase general brand awareness for the financial software company by targeting the office of finance. To do so, our team took a close look at the office of finance, and found that the audience was in the midst of an industry shift thanks to AI, but was having trouble visualizing what that change would mean for their day-to-day. So, the team put together an animated asset featuring AI-style audio contributions from well-aligned influencers like Chris Penn and Jennifer Warawa. It’s natural, given how wrought with influencer promotion our social media feeds can be, to assume that the main benefit of influencers is the promoting they’ll do on your social channels. But, as Zeckman points out, we can engage influencers in a variety of collaborative ways, even making them foundational elements of the content such as audio or video interviews, or podcasts or other serialized content. A great example of this is action is a podcast series Zeckman and the TopRank Marketing team worked on with 3M. The series involved 16 influencers across various scientific fields, including professors, teachers, astrophysicists, and chemical biologists, and was hosted by the Jayshree Seth, 3M’s Chief Science Advocate. The podcast series beat industry benchmarks by 69% with over 7,000 downloads. 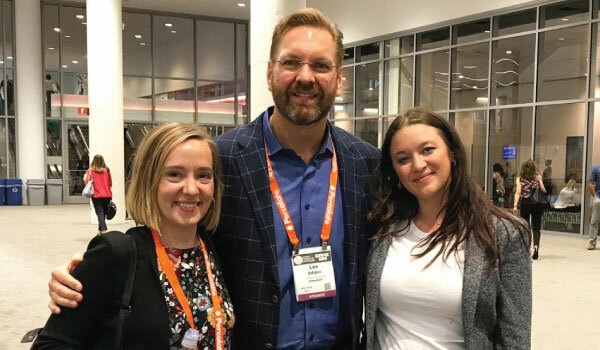 Many of the influencer guests amplified, employees amplified, and live events put on by 3M (involving some of the influencers who had contributed throughout the season) also helped drive awareness. Because B2B influencers are collaborating around an idea rather than just peddling a product, getting them involved is rarely as simple as purchasing a media spot. Zeckman has perfected the practice, and gives a few tips for engaging the ideal influencers for your B2B campaign. First, you’ll have to send out some signals. As a brand or agency, create content that features the individuals you’d eventually like to partner with on a campaign. The simplest way is to include them on any lists that you’re creating. TopRank Marketing, for example, recently featured people from all industries in the list the Top 50 Content Marketing Influencers, many of whom have gone on to contribute to B2B influencer campaigns. After you’ve started sending signals, nurture the budding relationship. Staying in touch is a great way to gain credibility with the influencer and encourage them to co-create content, amplify it, and stay in touch for future opportunities to collaborate. Above all, says Zeckman, be thoughtful in your interactions, and show your gratitude. Bonus points if you can show your gratitude in the form of pie, as the TopRank Marketing did for the influencers who contributed to DivvyHQ’s Easy as Pie campaign. Some believe the juice isn’t worth the squeeze when it comes to B2B influencer marketing, but that couldn’t be farther from the truth. Collaborating with the right influencers to create content is one of the most economical ways to build a successful campaign. For one thing, the content created with influencers has great potential to be repurposed. A blog post with influencer contributions can be grown into an eBook, Slideshare, or any number of other valuable assets. Most influencers are happy to expand upon a small contribution to provide more detail where needed, and that can be filed away for future, modular use. In addition, influencer content perfectly lends itself to curation. If you’ve worked hard enough to have a small arsenal of contributions, consider compiling them into a list and publishing them as a blog post. Quotes that hit home are easily converted to beautiful, shareable images. And don’t forget, says Zeckman, that your the influencers you involve are individuals. They’re real people who are most often thrilled to help amplify the content to which they’ve contributed. By providing influencers with social messages and images to share at the time of campaign launch, you’ve got a head start to promoting your hard work. And the payoff is worth it; Zeckman once saw a 1,700% increase in social ad clicks for a campaign as a result. Don’t believe the lies. B2B brands absolutely have an opportunity to collaborate with influencers and industry thought leaders, just like B2C brands have been doing for decades. Influencers can help extend your reach, lend authority to your content, and help you build credibility with your audience. What misconceptions or concerns have you heard about influencer marketing? Tell us in the comments section below.